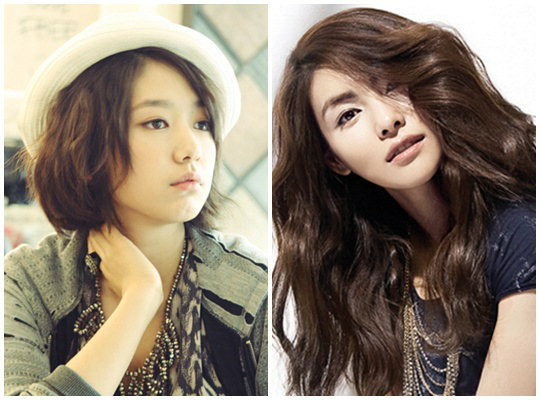 Actresses Park Shin Hye and Kim Jung Hwa have recently switched to a new management agency together. On March 7, 4HIM Entertainment Co. Ltd released a statement saying "Recently, Park Shin Hye and Kim Jung Hwa have signed exclusive contracts with us." The two actresses first met 10 years ago(2001) in their 1st management agency "Dream Factory", then they switched to previous management agency "Ava Entertainment" together in 2009 and now they are once again labelmates at "4HIM Entertainment". Having gone through 2 agency changes in 10 years' time together shows the strong bond of their sisterhood. Moreover, their respective managers have also been working with the actresses for nearly 10 years and have received a lot of praise from the public for thei loyalty. A representative of the two actresses said "The friendship between Park Shin Hye and Kim Jung Hwa is built with a lot of trust, orelse it's impossible. From the beginning to now, they have shown a lot of trust towards each other. Now they are no longer just "fellow actresses", but friends for life, striving towards their dreams together." Park Shin Hye's next project after her movie "Cyrano Agency"(2010) is currently under careful review and discussion. 배우 박신혜와 김정화가 소속사 전속 계약을 통해 친자매 이상의 끈끈한 우정을 과시햇다. 박신혜와 김정화는 신생 기획사 ㈜4HIM엔터테인먼트에 함께 전속계약을 맺으며 10년이 넘는 뜨거운 우정을 과시해 눈길을 끈다. 이번 계약을 통해 두 배우는 10년 가까이 함께 일해 온 매니저들과 두터운 의리를 과시하며 호흡을 맞출 예정이다. 2001년 소속사 드림팩토리에서 처음 인연을 맺은 박신혜와 김정화는 이전 소속사인 아바엔터테인먼트를 거쳐 현 소속사인 4HIM엔터테인먼트에 이르기까지 10년간 친자매 이상의 끈끈한 우정을 보여주고 있는 것. 두 배우 모두 여러 엔터테인먼트사의 영입 권유를 뒤로하고 데뷔 초부터 함께 호흡을 맞춰온 매니저들과 의리를 지키며 함께 계약을 맺는 등 훈훈한 모습을 보여주어 눈길을 끈다. 이들은 함께 봉사활동도 나서는 등 선행에도 앞장서고 있어 향후 행보가 기대를 모은다. 김정화는 최근 ‘근초고왕’ 후속으로 방송되는 KBS1TV 대하사극 ‘광개토대왕’에 광개토대왕의 카리스마 넘치는 호위무사 역에 캐스팅되어 캐릭터 변신을 시도한다. 영화 ‘시라노 연애조작단’ 이후 휴식기를 갖고 있는 박신혜는 차기작을 신중하게 검토 중이다. 김정화, 박신혜와 데뷔 초부터 10년이라는 적지 않은 기간 동안 함께 호흡을 맞추어 온 4HIM엔터테인먼트 이은영 이사는 “이렇게 오랜 기간을 두터운 관계로 함께 할 수 있는 이유는 서로에 대한 이해와 신뢰가 아니고서는 있을 수 없는 일이라고 생각한다”며 “믿음을 바탕으로 처음부터 지금까지 모든 시간을 함께 해온 연기자들을 위해서 단순히 일적인 관계가 아닌 인생의 동반자로 함께 열심히 해 나가겠다”고 밝혔다. hope that she can do even better in this agency ! It's very good to have a friendship like this ! IM happy for her !